The CAMWS Undergraduate Awards Sub-Committee annually awards up to two research grants supporting collaborative research between a faculty member and an undergraduate. These awards can be for up to $1,000 each. Applications are due by December 6th every year. These awards are intended to support faculty research collaborations in Classics (any sub-discipline) with undergraduate students. Faculty-student pairs may be from institutions with graduate programs, but the student involved must be in an undergraduate. Applications should include statements from the faculty and student researchers outlining the nature of the project, giving a prospective timeline for the project, an account of the respective responsibilities and intellectual contributions of faculty member and student, as well as a budget indicating how the money will be spent (the award covers such expenses as books, supplies, and travel for the student but not honoraria). The application should also indicate whether the project is receiving support from the applicant’s home institution. Finally the application should describe what the research pair envisages the nature of the final product to be, and what contribution it is intended to make to the field. We encourage presentation of the projects at a future CAMWS meeting. The faculty member participating in this project must be a current CAMWS member at the time of application. The undergraduate does not. 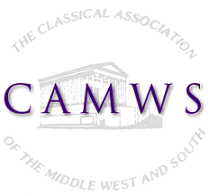 If awarded the grant, the undergraduate will receive a complimentary membership in CAMWS for the year of the grant. A final report is due to the CAMWS office at the end of the project (no later than a semester after the receipt of the award). The report is to include statements by both student and faculty as well as a summary report about the money spent. Any funds remaining are to be returned to CAMWS after the final report is submitted. The award of up to $1000 will be paid to the Department or a suitable institutional office. The contribution of the faculty member will also be recognized by CAMWS (on CAMWS website, program, and by a letter sent to the faculty member’s chair). For further information, contact the chair of the CAMWS Undergraduate Awards Sub-Committee at undergraduate@camws.org. Dr. Krishni Burns (left) and student Samantha Lindgren (right) of the University of Illinois at Urbana-Champaign celebrate their project "The Living Odyssey Project: Greek Myth in 21st Century American Folklore." Here is the abstract for their project. Dr. Alden Smith (left) and Cynthia Liu (center) of Baylor University receive their award for their project "Chrysis: A New Edition of Enea Silvio Piccolomini's Comedy" from Timothy Heckenlively, chair of the Manson A. Stewart Undergraduate Awards Sub-Committee. Here is the Abstract for their project.